Your business may be well-armed against email-based phishing scams, but you shouldn’t neglect your VoIP (Voice over Internet Protocol) systems. 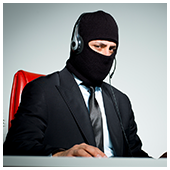 Through ‘vishing scams,’ hackers can disguise themselves as a bank representative and convince your employees to provide confidential financial details via a seemingly harmless VoIP call. Your business will be well-served by guarding itself from this new breed of phishing scam. Using a fake number, they can call one of your employees, pretend to be a bank or government representative, ask for critical business information — like employee data, bank details, and company intellectual property — and get away with it. Scammers can also manipulate local numbers to emulate multinational banks, which they will then use for various VoIP scams. Other than traditional phones and email phishing scams, cyber criminals are resorting to VoIP scamming due to its cost-efficiency. Vishing scammers are sneaky and resourceful, and they will exhaust all possible means to attack your systems for profit — that includes your VoIP channels.